As we already mentioned in our previous blog post “Purchasing Banners Online”, it is really important when buying decals for your business or your personal family use that careful consideration be given to the website that you are buying these decals from. You want a business that has a phone number so you can actually speak to a live person. Here at Signs World Wide, we pride ourselves in superb customer service. Have a pre-order decal question? Just email or call us. Have a question about your recent decal order? We would love to hear from you. Here are some additional items to consider when researching the best place to buy decals online. Before installation the difference between the two types of decals are very subtle. The difference becomes more apparent when installing and after installation. Printed vinyl decals tend to be easier to install and essentially are like a “peel and stick” sticker. These decals are printed directly on white vinyl. This process allows the decal to have many multiple colors and can be photo realistic. This type of decal is great for photographs, gradients/shading, illustrated artwork and when many colours are needed. Die-Cut vinyl decals can be a little trickier to install, but the end result looks like it was hand painted. This type of decal uses no background and is die-cut from pre-colored rolls of vinyl. This makes die-cut vinyl decals having a color limitation more expensive for multiple colours. Die-cut vinyl decals don’t fade in direct sunlight and are thin enough to conform to different types of textures. In conclusion when deciding on which type of decal you would like, you have to look at where you are going to install the decal, your budget and the installation process. 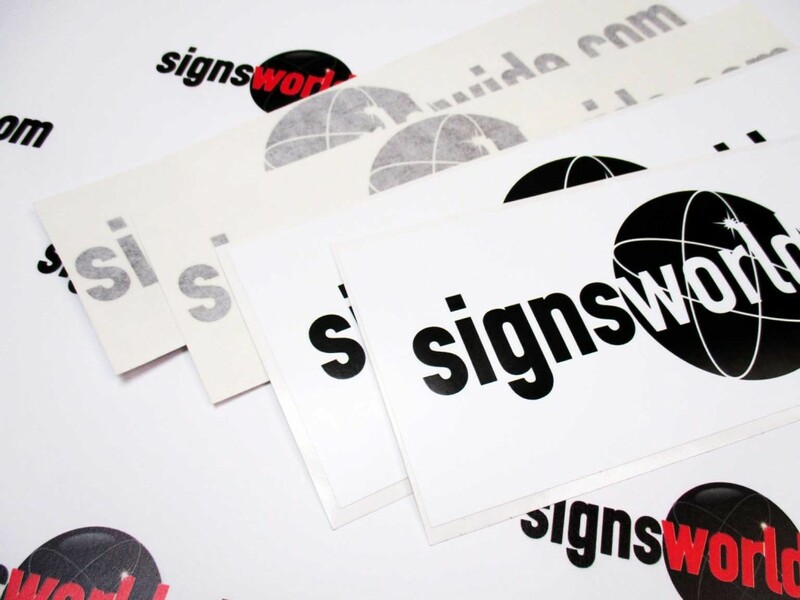 Don’t hesitate to purchase your next great business or personal vinyl decal today from Signs World Wide. Call us toll-free if you have any additional questions or comments.